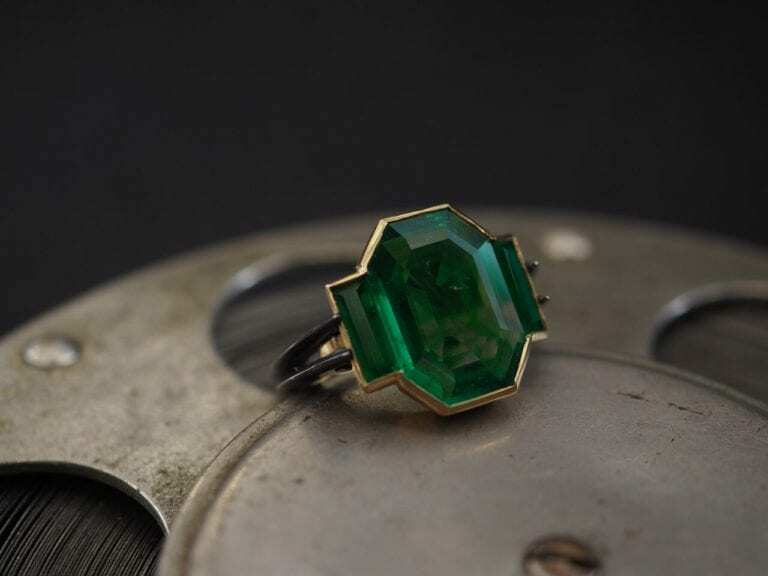 There has been a trickle of emeralds from Ethiopia for decades, but a new find in 2016 has created quite a stir in the gem trade. 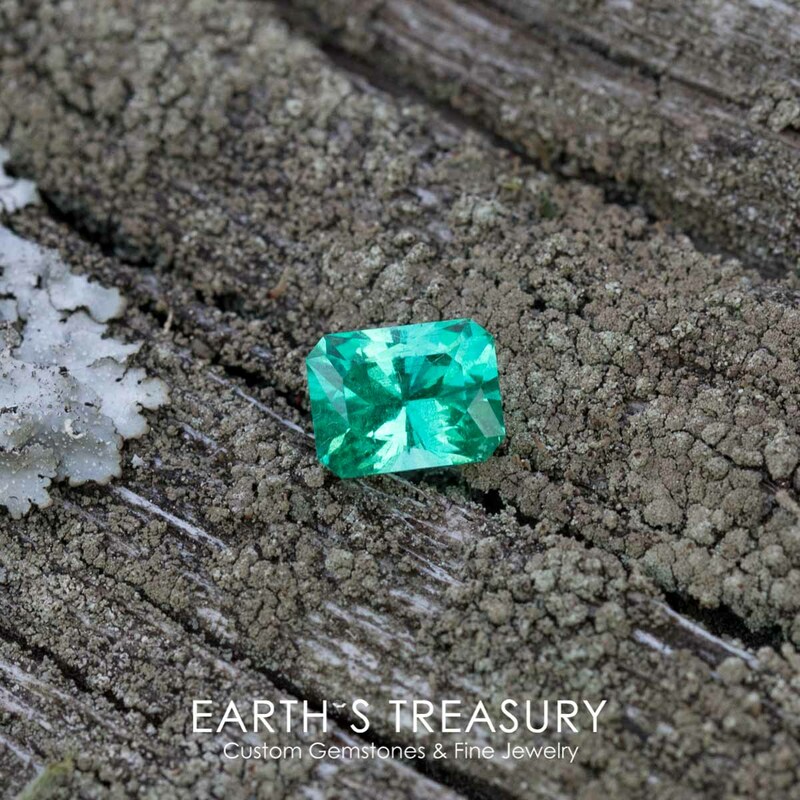 Learn about the quality, source area, and gemology of this deposit and how pricing of Ethiopian emeralds compares to those from other sources. 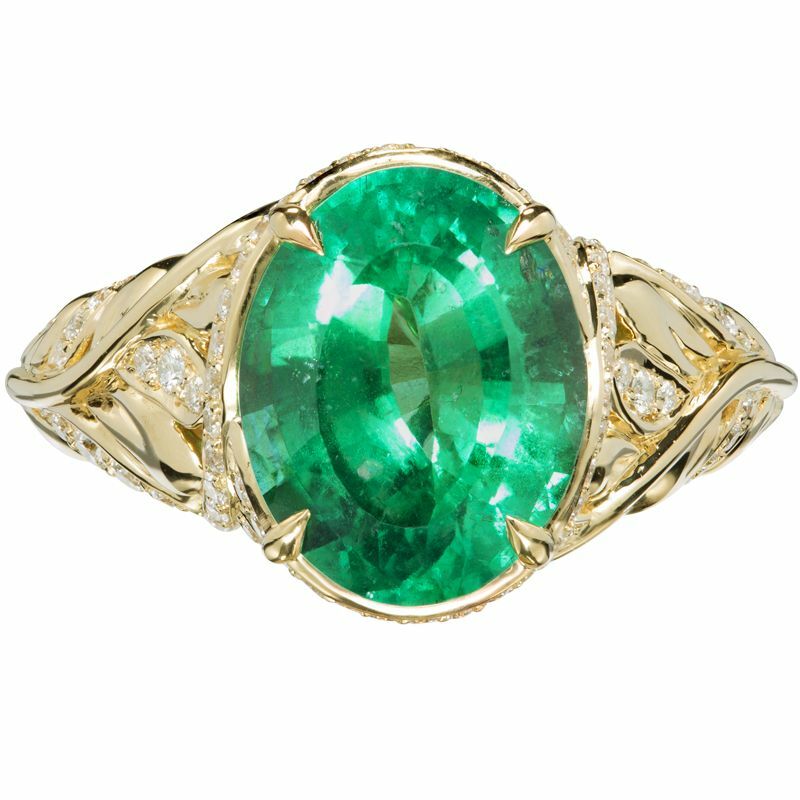 An intense, electric green color is highly desirable in emeralds. 4.84-ct, no-oil Ethiopian emerald with diamond accents. © Kat Florence. Used with permission. As with any gem deposit, Ethiopia produces emeralds with a wide range of quality. Much of the material is commercial grade, often heavily included with black mica crystals. However, some truly amazing gems have come from this deposit as well. The top-quality stones from Ethiopia are grass green or green with a hint of a blue hue, and have no need for oil enhancement. Even more exciting is the saturation of these stones. These bright, saturated greens are comparable to stones from the Colombian mines. 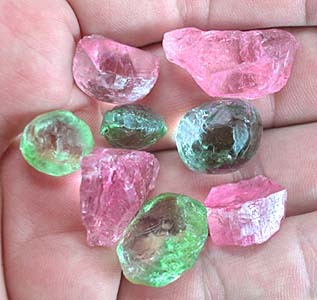 Some dealers describe the color as “glowing” or having a “neon” quality and compare it to paraíba tourmaline in this regard. With a glowing emerald green hue, it’s no wonder that jewelers liken these stones to paraíbas. © Earth’s Treasury. Used with permission. Chromium and vanadium are the primary coloring agents in emeralds. Chromium dominates in the emeralds from this new deposit, just like those from the famous Colombian source. Gems from Brazil and Zambia, on the other hand, have less chromium and more vanadium. Some extra-fine gems even exhibit the gota de aceite or “drop of oil” effect so coveted in emeralds. 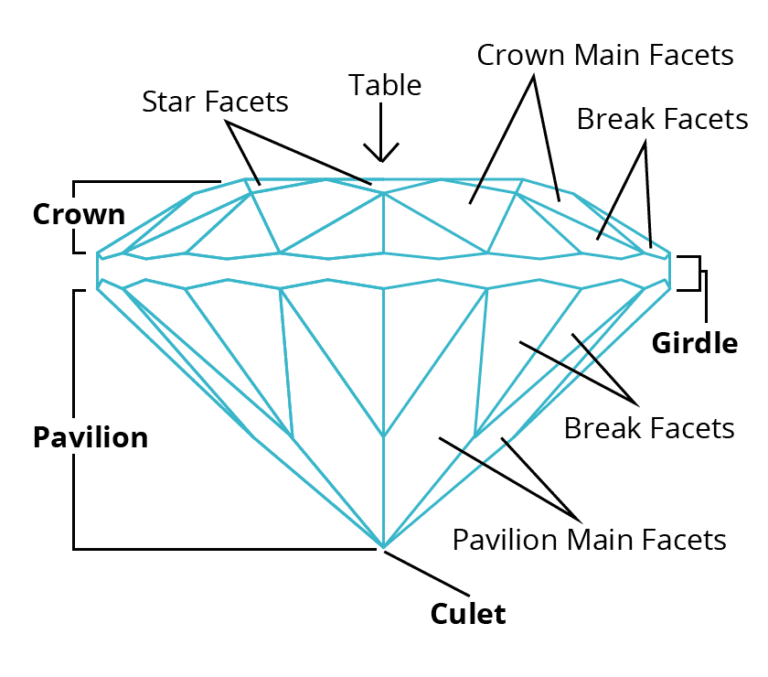 Although some large stones occur, most gems cut under ten carats, with the majority between one and three carats. 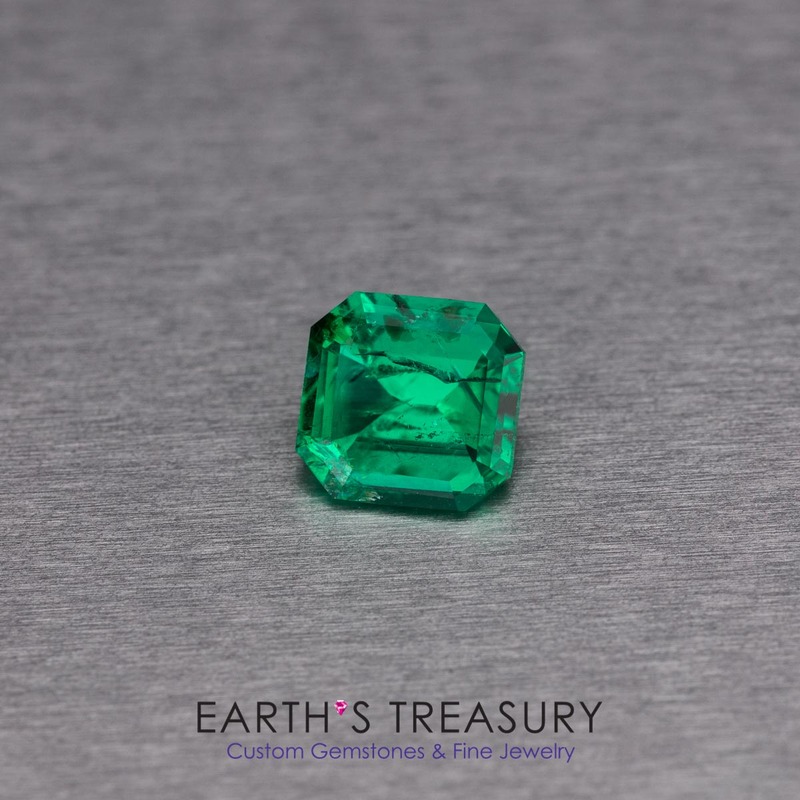 At 0.46 cts, this emerald isn’t large, but its saturated green color makes up for its small size. © Earth’s Treasury. Used with permission. 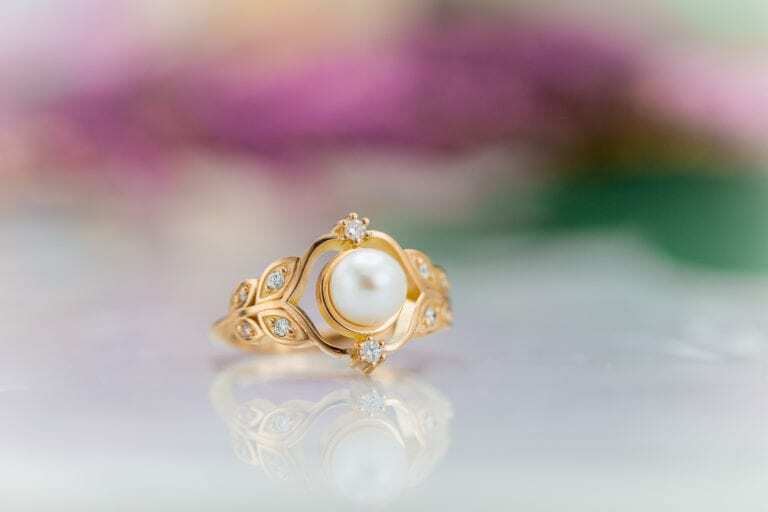 Prices of these gems haven’t yet settled and are steadily rising. However, some guidelines may help you when purchasing one of these gems. Most prices have a slight premium when compared to Brazilian and Zambian stones of similar quality. Still, they’re much less expensive than their Colombian counterparts. For the consumer uninterested in origin, an Ethiopian emerald may mean a 30% discount! Much of the rough material sold thus far has been in parcels with a wide variety of stone qualities, with no picking permitted. Thus, a few amazing gems are mixed in with commercial grade rough. 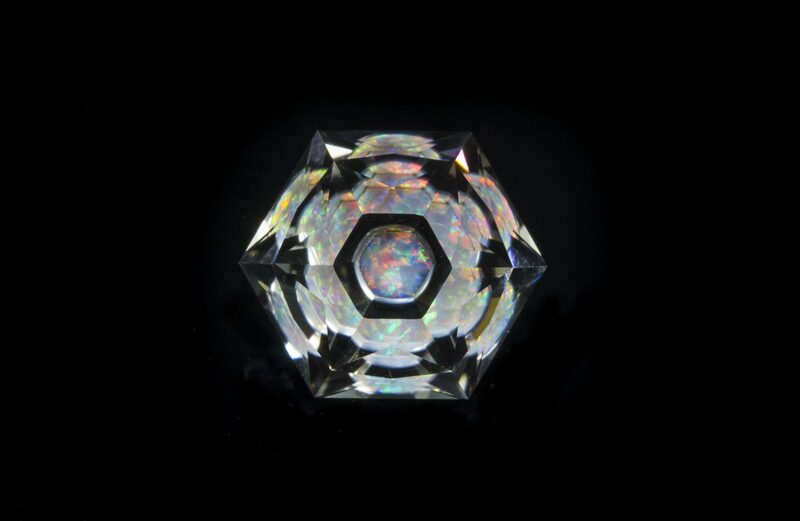 Although there are exceptions, many crystals have only a small facet-grade portion. 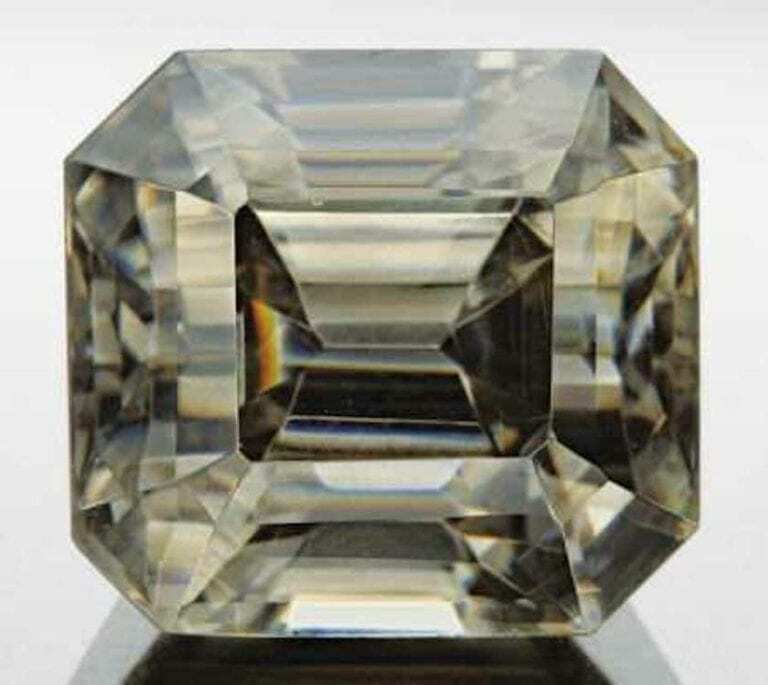 For fine-quality gems, lapidaries need to cut away much of this rough. 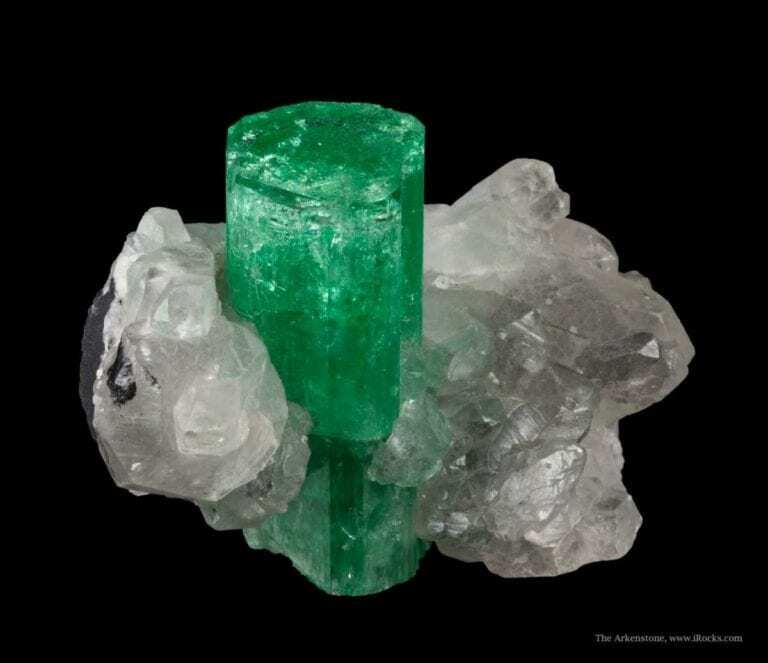 Emeralds originate in the Oromia Regional State in the villages of Kenticha and Dermi. The stones are sometimes called “Shakiso Emeralds” for a town 160 km north of the deposit where they’re traded. Rough “Shakiso Emerald” crystals. Photo by Jason Baskin of Jay’s Minerals. © The Gem Vault. Used with permission. Due to concerns over security and instability, the Ethiopian government tightly controls mining and trading. Since the deposit’s discovery in 2016, mining operations have been temporarily halted for several weeks due to security concerns. Furthermore, the Ethiopian government heavily restricts access to the mines. Anyone seeking to deal in these emeralds will need federal and regional letters. Several associations manage their own area of source rock and the rough it produces. Artisanal miners extract emeralds by hand, making mining slow and sometimes sporadic. 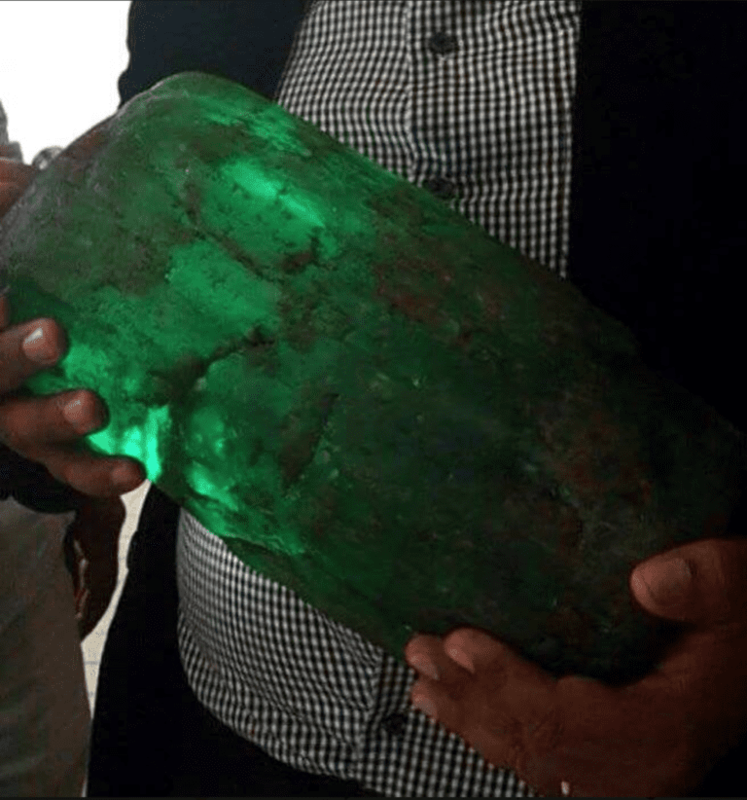 Still, the newspaper Addis Fortune reports that, as of August 2017, the export of 2,000 kg of emerald rough has generated about $7 million and employed around 30,000 people. 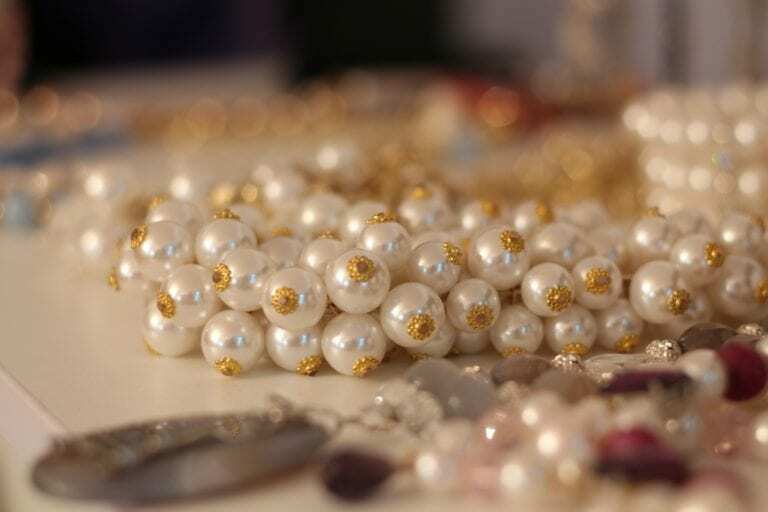 Continuing exports of gems will aid in Ethiopia’s already fast economic growth. 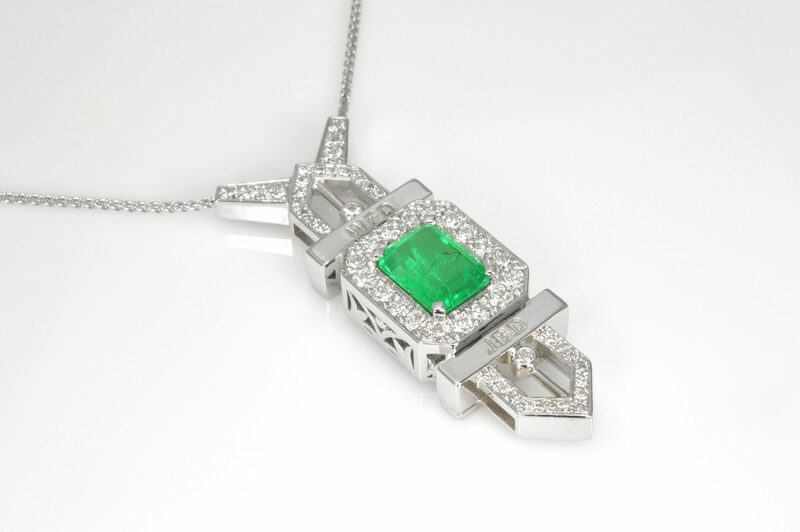 14k gold pendant with 3.24-ct Ethiopian emerald, designed by Sharon Curtiss-Gal. © The Gem Vault. Used with permission. Ethiopia has a rich geology, with the East African Rift system running through it and hydrothermal activity associated with this tectonic feature. Emeralds, which form under rare conditions in hydrothermal veins, occur in a schist host rock in the south of the country. Here, fluids rich in silica from deeper granitic intrusions create the conditions necessary for this rare stone. Deposits in Brazil and Zambia also occur in a schist host rock. Famous Colombian stones, however, come from a carbonaceous shale. Emeralds from schists tend to have moderately high iron content. The Ethiopian emeralds are no exception. The iron atoms make the stone inert to ultraviolet light, suppressing fluorescence. This means that these stones don’t fluoresce in daylight like their Colombian counterparts. Thus, Ethiopian emeralds appear similar in daylight and artificial lighting. 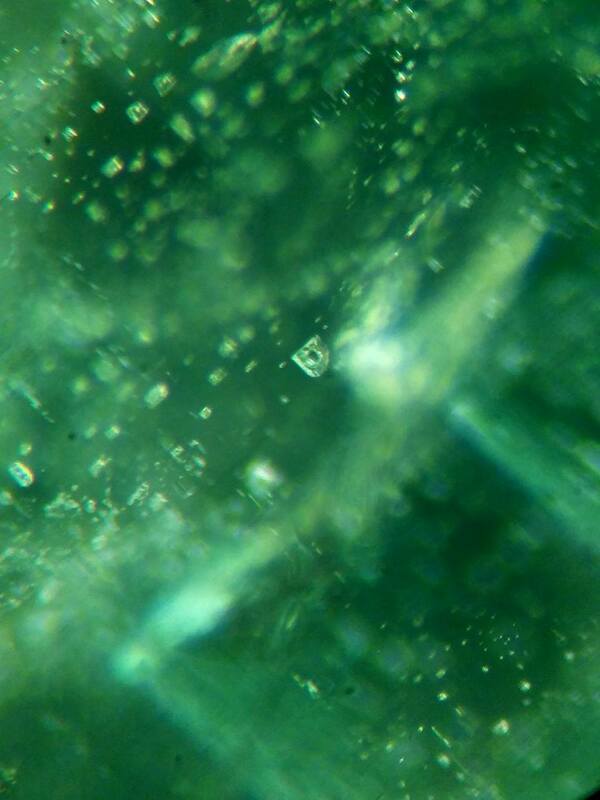 Common inclusions include biotite crystals and multiphase inclusions, again similar to other schist-hosted emeralds. Under magnification, gemologists can observe multiphase inclusions like the one in this photo. © Earth’s Treasury. Used with permission. Because of the relative obscurity of the Ethiopian deposit prior to 2017, some dealers would mask the origin and falsely sell stones as Zambian. 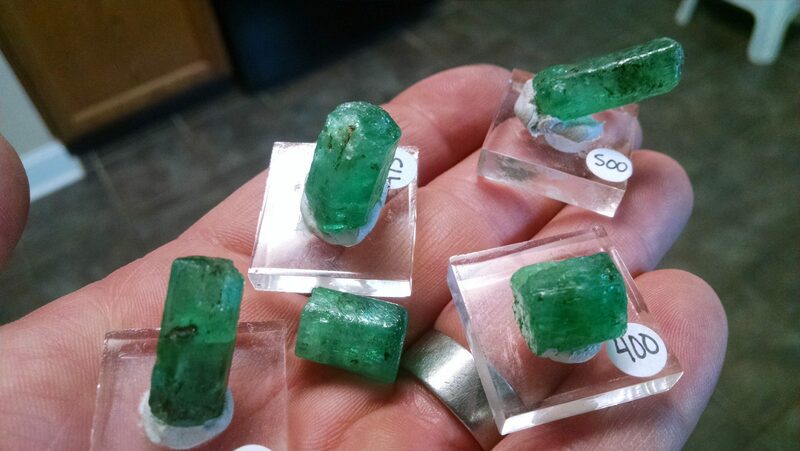 While this was rare, some early Ethiopian emeralds may be mislabeled. Fortunately, the GIA reports that gemological laboratories can distinguish between Zambian, Brazilian, and Ethiopian emeralds through trace element analysis using LA-ICP-QMS (laser ablation, inductively coupled plasma, quadrupole mass spectrometry). Each source area groups separately on ternary diagrams of Cs-Li-Rb (cesium-lithium-rubidium) and Cs-Sc-Rb (cesium-scandium-rubidium). This allows for distinguishing geological origins. Ethiopian Emeralds or Colombian Emeralds? 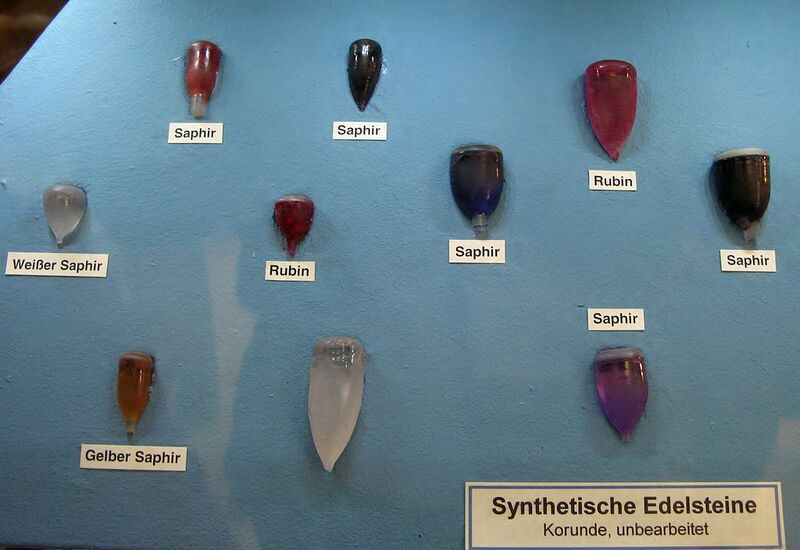 Any gemstone source can produce fine material. Ethiopia is certainly producing gems that rival fine Colombian stones. Some of these stones are certain to make their way into important collections. 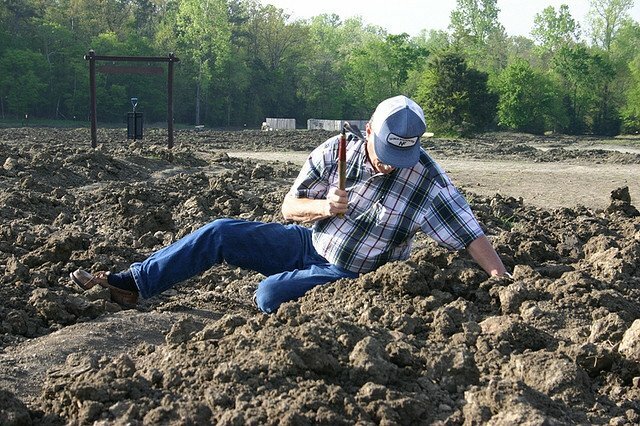 Still, much of the rough produced is commercial grade. Yield is generally low, due to heavily included rough, and fine gems are rare. 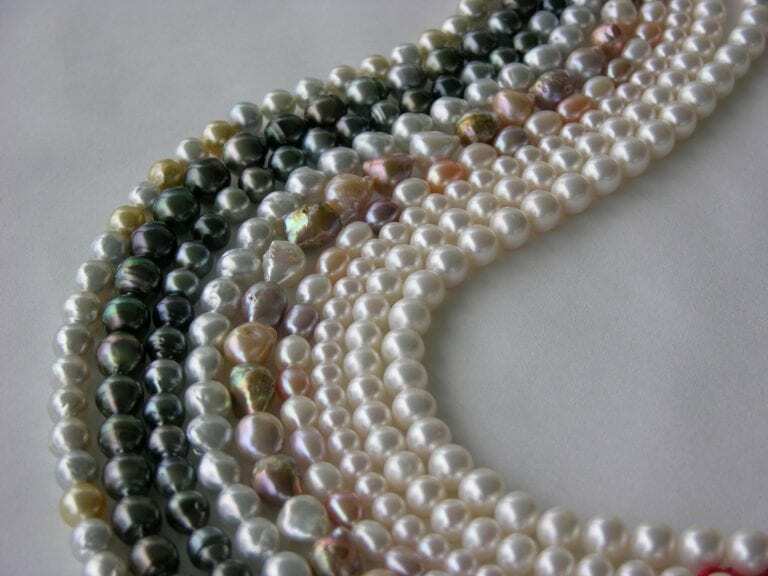 Traditional sources for gemstones have long commanded premium pricing over new finds. The emerald trade is no exception. If you’re seeking a chromium-colored emerald on a budget, Ethiopian emeralds are a great choice. 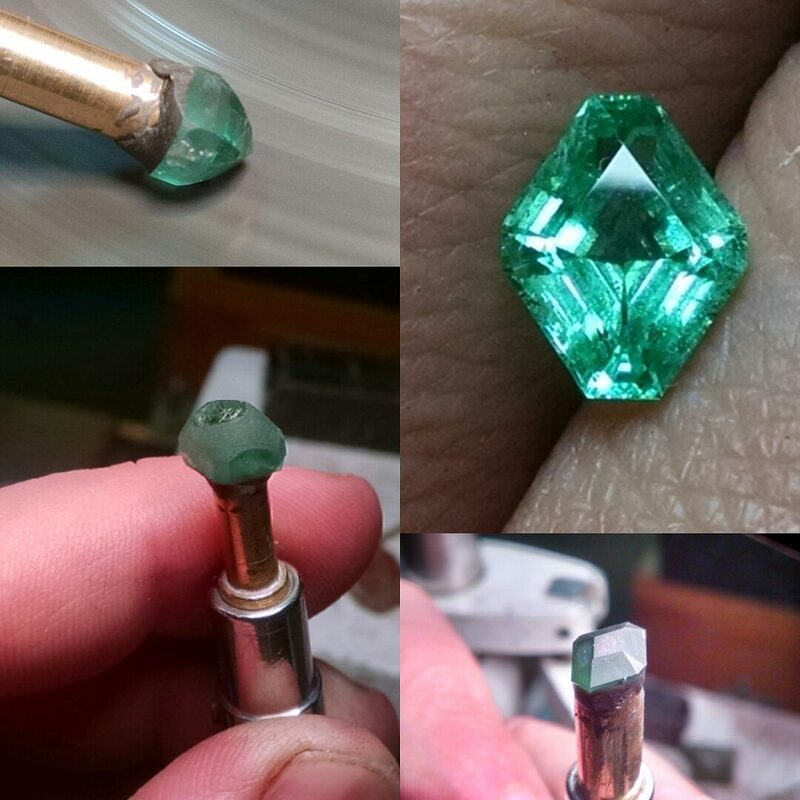 Ethiopian emerald, from rough to finished faceted gem. Photos by Jason Baskin at Jay’s Minerals. © The Gem Vault. Used with permission. A geologist, environmental engineer and Caltech graduate, Addison's interest in the mesmerizing and beautiful results of earth's geological processes began in her elementary school's environmental club. 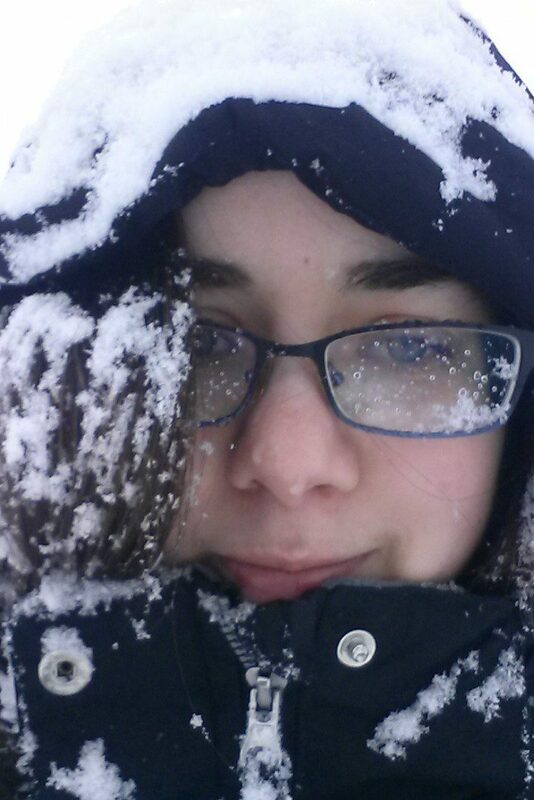 When she isn't writing about gems and minerals, Addison spends winters studying ancient climates in Iceland and summers hiking the Colorado Rockies. Fake News in the Gem Trade: A Waterworn Emerald from Chivor?